TeraGanix Blog: How to Compost in an Apartment – Meet the Bokashi Food Recycling System! How to Compost in an Apartment – Meet the Bokashi Food Recycling System! Are you environmentally conscious but live in an apartment, condo, or town home that makes composting impossible? You’re not alone. There are many people like you and if they haven’t discovered the Bokashi Food Recycling System yet, we hope they will now. Although anyone can benefit from this accelerated fermenting system; the way it’s designed is exceptionally apartment-composting friendly - or any small or highly populated space! Not only does Bokashi decompose your food in 1/3 of the time normal composting takes; the biology involved means virtually no odor or bugs either and in a very compact way that makes composting in an apartment effortless. Since it’s more of a fermentation process rather than composting, it’s significantly easier, less pungent and time consuming than the typical method. It will even break down foods that normally take too long or smell too rancid when traditionally composting. The Bokashi system ensures you can compost no matter what restrictions your home might have. Your compost container is always important but when composting in an apartment, it’s even more important. You need to use a smaller container than you would if you had a garden immediately outside. Some people even suggest having two containers so you can start processing one batch and by the time you’re done processing the second, the first will be ready to go with a free bin for your next set. No matter how many you choose to have - a box, garbage can, ceramic unit or container no bigger than 10-20 gallons should be sufficient. Remember, the unit must be completely airtight for fermentation to occur. 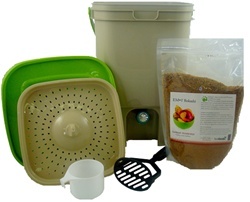 If you purchase a Bokashi Food Waste Recycling Kit then the container comes with it and there’s no need to hassle with purchasing additional items. This is the option we would recommend since the containers included in the kits are made for Bokashi fermentation specifically and are just small enough to tuck away into a convenient place such as a pantry or under the sink. Meat, fish and dairy – yes you can add these but only if you’re using Bokashi! Inedible items such as plastic & foils (except for paper). "Compostable" bags, utensils, etc. that require high heat to break down. Once you’ve properly set up your Bokashi Food Recycling System and it’s filled to the brim with food scraps it’s pretty much hands-free after that. Unlike traditional composting, your job is basically done once you snap the lid on. The only task left is leaving it alone for the next 2 weeks while the magic happens. If you have the Bokashi spigot bucket then you don’t even have to wait a full two weeks to reap the nutrient rich rewards of your composting. Just drain the fluid from your bucket every other day and add it to your water when maintaining your plants. By using just a teaspoon of it with a gallon of water you will immediately start seeing improvements in your plants. After about 2 weeks you should be the proud owner of some of the most nutrient rich food waste possible. Congratulations! Not only did you save the Earth quite a bit of pollution, you’ve saved yourself stress, time and money as well. This final product will help repair any damaged plants you might have or enhance healthy plants with room for improvement. The material can be used in planters, a community garden, or in a compost pile or worm bin. You will empty to contents of the bucket into a trench or hole (mixing with soil as you empty the bucket) and then cover with 8-12 inches of soil. Leave the materials in the soil and they will finish breaking down in a couple weeks, feeding and amending the soil the entire time. Another popular option is adding it to a larger compost pile to help accelerate the decomposition process. You can even feed it to livestock or worms since it's chock full of vitamins, amino acids and other beneficial nutrients for animals. If you’ve ever composted you can appreciate how much time and effort the Bokashi Food Recycling System saves. We’re so happy to find a solution for many of the common reasons so many apartment dwellers or even house dwellers don’t currently compost. If you know someone that wants to compost but thinks it’s too smelly, time consuming, limited or complicated-you should introduce them to the Bokashi system, especially if they live in an apartment! Once you start using it you will no longer be limited to certain foods, lengthy time periods or unpleasant odors. Honestly, why would you compost any other way?